I'd used Sygic for years around town and long distance. I had been very pleased and impressed. Great features. Purchased upgrades too. However, as of the entire past year 2018-2019+ I get occasional, but not rare, "no such address" "check downloaded maps" even for PLACES I'VE BEEN TO USING SYGIC BEFORE, for places that are in the same town that I reside in, for nearby addresses in my Contacts, all have been places Apple Maps and Google Maps etc can locate. I've lived in two different states yet the same issue occurs randomly, I can't figure out a pattern. Doesn't matter whether it's a business or residence etc. Yes, I've written to support. It's now been too many times to bother "troubleshooting". I just complain. After a year of this my review changes to 2 stars because I'd have been in trouble on the road had I to rely solely on Sygic. أتمنى يعطي نفس البحث في قوقل ماب . In an effort to create more revenue Sygic has changed the use of their app, if you have an iPhone. My Sygic was working fine to include the lifetime license on North America. They then announced the news that CarPlay for Apple would cost another fee. $39.99 if I recall, after it worked fine before. So now I’ve got a useless lifetime license I can’t use because I have an iPhone. I will not endorse Sygic to anyone. I will warn all people I know, NOT to use this at all, due to their less than honest means of revenue generation. On iPad there is no way to opt out of ad tracking. The only button displayed says “Yes, I agree” even though other UI text implies the user has a choice. Not cool. So glad I can use Sygic with Siri Shortcuts now!! 4/2/2019. The latest update is horrible. The directions display, in the upper left hand corner of the screen, takes up most of the screen. 7/31/2017. Once in route to a destination. Need the ability to find an alternate route. Also, traffic sometimes says "no delays on the route" where that app shows delays. The two features are not in sync. 5/23/2017 l1 Version 17.1.0 is a great improvement. It still has a problem with importing contacts. 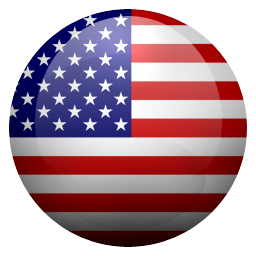 If the contact has United States in it. It says cannot find address and brings up the Map option. Otherwise, great improvement. I haven't tested it completely. 2 Google street view displays zoomed in views for certain locations. 6/16:2017 Major improvement. Some minor bugs: 1 Google Street view crashes sometimes. It completely closes out the app. 2 would be nice if the gas icons would only show up on the map view as optional. It always shows up when on the freeway. This should be optional. 3 when pasting complete address with zip code. App says "Not found ". Even though address is valid. 4 How do I add widgets to the main screen? Where SOS widgets are. Absolutely unfriendly. Now my downloaded maps are non-existent. I have lifetime subscription North America edition. At least I paid for one. But can add no additional maps, except for Mississippi. I don’t want or need map for Mississippi. I live in Idaho. I have noticed that many times the speed limits are not matching with the actual posted speeds. No construction on these roads that I travel on daily. I’m just hoping this will be looked at and corrected. I originally bought lifetime plan. When I got a new phone they changed my plan to where now I have to pay extra for voice directions. So, lifetime only works on the phone you originally purchased it for. Some of the display options are good and have potential. Car play only works on a small selection of cars.The problem is the underlying data base. Routing takes some weird turns. It is so deficient that it renders the app almost unusable. 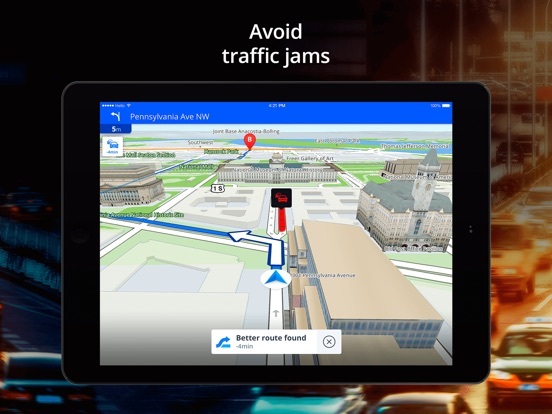 This app can take you to wrong places so keep an eye on the rout it choose so you don’t waste time. I’m using the app for many years but stop working properly and it doesn’t look like is going to be fix. Buying a regular gps. Complicated GPS, not easy to use was a waste of money and time. Hi, I Paid more than 100$ For In App Purchases But In just 25 minutes it exhausted 100% of battery, what happened?! Was supposed to cost $25, charged $35. BS. Maps don’t have real time traffic updates as Google/Apple/Waze maps have. Please improve in this area. I have tried offline feature. It works good. We need the app to also remember where I parked when the car is parked so it can guide the user back to parking if needed. Google /Apple/ waze have this feature. Please help incorporate these features in your next release . I love this app. It’s so easy to use and directions are great. This app is fantastic for going to different countries. I love being able to download the maps ahead of time and not having to worry about internet access. I have used it in Ireland, Australia, Germany, and all over the USA. I used the trial version of the app and it supported car play nicely. Since I liked the offline maps with car play, I paid for the premium version. Now I notice that hardly any features are supported with car play after the trial period is over and i need to buy a separate premium package for that. It’s totally misleading. Please suggest how I can cancel my premium as it is useless for me now. They supposedly use Tom Tom data, but its missing a lot of roads and addresses that my Tom Tom map app has. Still no improvement after last updates. Lots of speed data is inaccurate as well. I brought this app because of the hype but the app is too slow and and it takes me the wrong way. I compared it to Apple and Google Maps found those app much faster and easier to use. I got the refund for the app but no the map. I am trying to get support but no one is helping me. Seriously, I put my destination in and it took three minutes on a iPhone 8 to get the wrong directions. Needs a ton of work. $10.99 down the drain. Best Free GPS app out there! I needed a gps app that was easy to use, no BS, and worked 100% offline. This is EXACTLY what I needed. I use this for EMS and search and rescue calls in my community, as well as my personal use when traveling. Download this app, you will not be disappointed. It has a premium version, but it is a truly free app that works offline. Never thought GPS can be fun. Thank you Sygic. To use CarPlay you need to pay more!!! I already paid for premium version for North America will lifetime access, however to use it with CarPlay I need to pay $50 more!!! I’d rather use Apple maps and Google maps then paying more for Sygic. Regret wasting money in a first time!!! It won't allow to restore prior lifetime purchases after following instructions. Not only that but I've sent 2 emails following the support link on their own website & Sygic won't answer my requests. I know they will respond to this now with a canned reply as usual. Complete joke! I'll be hesitant to trust Sygic with my business again. No more! I purchased premium plus traffic a while ago. Premium plus traffic has been upgraded to be compatible for car play. Sygic has ignored my prior purchase and now wants additional to use what I have already purchased. Even Apple does not charge for upgrades!! Do not use this navigation app. This company certainly chooses to not treat their customers fairly. I love the app for the little speed limit notice in the lower right corner. It also shows my speed a I set it to turn red a 5 miles over the speed limit. For this, it would be better if it flashed a couple times as I exceed the 5 MPH over. But my big gripe is the verbal directions are quite stupid. I recently drove along a straight road with one route number for about seven miles. At virtually every intersection with a traffic light a voice told me to continue straight ahead! This happened about 15 times before I shut the voice off! Please fix it. I am Stephen in Safety Harbor Florida and I was traveling to the USF eye Institute in Tampa. There is no way those guys have any meaningful quality controls. - App crashes in the middle of navigation - Address data incorrect for the US - I see a city name that does not exist or the address is shown in German style instead of American style - They never got voice prompts to work correctly when you have music playing from another app. I had other apps that could do that. I’m guessing Apple probably provides the API to allow a navigation app to temporally suspend or lower the volume of the background music, deliver its voice prompt, then restore normal music play. They never got that to work on Bluetooth at least. Makes me wonder, are those guys even testing their own software? And why are the reviews so glowing when the app has obvious bugs? Buyer beware: I paid a lot for this app and its add-ons, and still end up using the iOS built-in Maps because this app is unusable! Where are my previous Sygic apps that I bought? Now able to give accurate traffic info on the way as not reflecting real-time situations i.e. road closures, one-way, no turn etc... A lot of attraction points not included in the search bar!!! What a waste of money, should have stick to Google Map only. Fix it or give me a refund now!!! 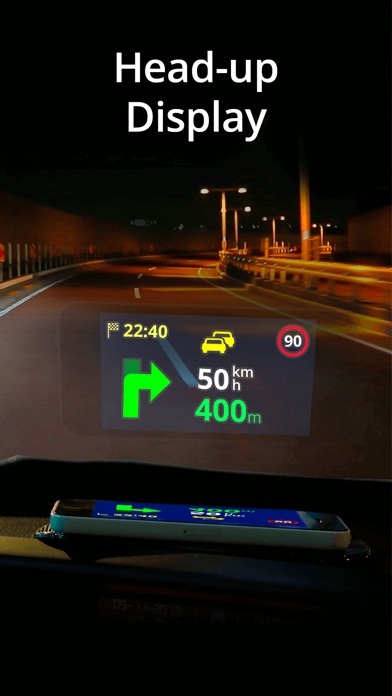 The app has a great interface and some novelty features such as real time navigation and sub par HUD. Route planning and rerouting are very rigid, way below average. Dashcam works fine BUT only when the app is open, it doesn’t record when you switch to another app which is not good at all. Google maps is easier to find addresses and more accurate. Love the speed limit warning feature! Wish I could change voice to male. Overall I like this better than google maps and others. The view is easy on the eyes and the voice is clear and pleasant. However it has had me do a few out of the way turn arounds. For example when I leave a plaza some times it will have me take a left go down the road a ways then turn onto several side streets until I’m back at the road I started on just to then take another left turn when I could have simply turned right leaving the plaza. Other than that it works pretty well. I use this for package delivery because sometimes I am in an area of terrible or no service. This has saved me many times! Maps are missing streets and areas outside of larger cities. Generally works as expected, and the downloadable maps are a godsend when driving where cellular or WiFi are not available or affordable. But when I connected earbuds to the iPhone in my pocket and used Sygic to give me directions while walking through Paris, France, the routing and voice commands went haywire, telling me arbitrarily to turn left, right, left, right, left as if I were doing somersaults. I had to turn off the routing and just use it as a plain map. Also, when using GPS my iPhone’s battery drained rapidly; a backup power pack is essential. Sorry 😐 but I gotta say this. A gps should not include a schedule for Muslim. A gps should include map information. Great app but not to include a scheduled prayer 🙏🏽 for Muslims. Seriously, The only reason that I don’t use this as a primary GPS is due to the next turn being displayed when you get real close to it. This is the ONLY GPS on the market that doesn’t display the next turn the entire drive until it occurs. This is so annoying that I won’t use the map (continue on route until .5 miles away then show me my turn ) is unacceptable. Fix this!!! Never got past the opening page with the logo. It caused my iPhone to freeze up on the opening page with the logo, rendering my phone virtually unusable until I could get home and call Apple support on my landline to help me force shutdown and reboot. Fortunately I wasn’t dependent on the app to find my way. Fantastic! Fantastic! Fantastic! I used to be a loyal Copilot user, but, it won't run correctly on my phone, and they haven't fixed it... So after MUCH trial and error, I found Stygic. I love it! My only real complaint is the nighttime driving colors. Blue?!? Really?!? Non-adjustable BLUE??!?!?! As a pilot, I can tell you there's not a flight station (cockpit) on any plane in the skies that uses BLUE nighttime lighting. There's a reason for it; it's hard on the eyes and hard to see at night. RED, and shades of red would be preferable! RED, RED, RED!!!!!!! Other then that, good show! After paying for North American Premium, and promises of Apple Car Play, NOW they want another $40 to implement that. For shame. And all you get in response to the reviews here are stupid stock non-answers. WAZE is free and superior in every respect. If you need downloaded maps Magic Earth is free, has superior maps (road, terrain, and satellite) and works seamlessly with CarPlay. It also properly predicts arrival times and gives sensible routes. Sygic is a greedy, non-responsive company. I was excited to see a CarPlay available app that supports offline maps since Im cheap on data. 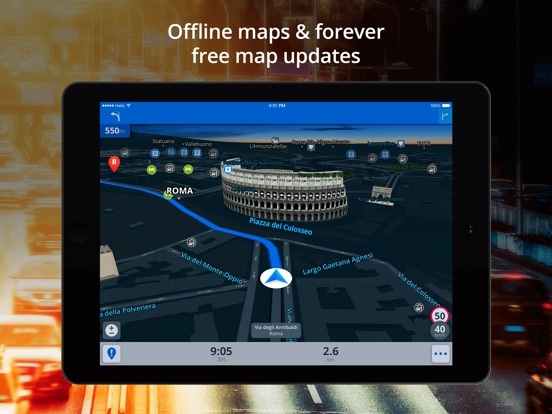 Paid for the lifetime maps & traffic, along with the CarPlay support. The app is a great concept, but definitely not there. I dislike how the app assumes you’ll be taking the turn it tells you to, then has to reroute and re-orient the map in the direction you’re actually traveling. Why not take the turn the map suggests? Because he has me taking an additional 10 minutes out of my way to go home and constantly tells me to U-turn at every intersection until I get closer to being home. The live speed is waaay off in their calculations! Looking at my speedometer along with radar signs, they all align, but this app has me consistently 10MPH+ the actual speed. If I’m driving 75mph, which is the interstates speed limit, it says Im going about 87mph! If I’m driving at 45mph, it has me at 55mph. Some intersections in my home town go into a divided highway, but tells me to keep left? (We drive on the right side if the road in the USA...) If the developer is willing to reach out to me, I’d be more than happy to work out all the kinks & glitches that I’m stating here. This is all over 2 days of use, and unfortunately I’m thinking if uninstalling to regain wasted space on my phone since this app works worse than the free data hogs. Future buyers beware! I’ll be more than happy to update this review if the things above change for the better. Started out to be a good app. Then it started showing 30 mph as 50 mph. Also shows cars speed as 20 miles over what I’m actually doing. Support team only has stock reply. A paid app that’s a waste of money. Do not buy this. Use Waze for free. It always works. I have been using this application for navigation for more than a year.. it’s great and easy to use and never had any issue.. good thing is now it supports CarPlay but last time I checked to see all instructions on car display you need to buy CarPlay pack in application. But with recent update developers say you will be seeing instructions as well on CarPlay.. will update more.. I really wanted to like this app. The interface is good and displays lots of information. But it fails at the main function it is supposed to do...find quick and accurate routes. On many occasions it will have me exit the highway only to get right back on for no reason. Additionally, it doesn’t find locations most of the time without having to find the address in another app. And the “add ons” like traffic and map updates are expensive. Even if you buy their lifetime updates, they require you to buy it a second time if you want to use the app through CarPlay. Downloaded this app months ago but only used it once or twice because the search bar was horrible. I was using Google Maps and I never had issues finding places near me. This app seems to expect you to know the full address of where your going. You can’t just type in the name of a restaurant. This is just frustrating. A few days ago, I decided to give the app one more chance because I liked the idea of the augmented reality feature ( which I paid for). I tried it for the first time today and it was a total let down. The idea is awesome but it’s hard to tell where your next turn is. The AR screen tells your speed and distance but there are no cues to warn you about exits, turns, NADA! Nothing! I missed my exit because the sound was turned down and you simply can’t see the turns in AR mode. I’m going to triple check that I didn’t miss a setting somewhere because I really want this to work. If not... I’m going to request a refund. UPDATE: still no sound! Then when you get online to try and contact the seller, they just send you in circles. There is no clear way to request a refund. I’m sure I can call itunes but why not make it easy? BECAUSE YOU DONT WANT TO GIVE $$ BACK FOR A POOR APP! Sometimes customer service is what makes or breaks your company...hiding your non existent service Dept behind links that send you in frustrating circles. I WILL BE TRYING TO CONTACT SOMEONE to try and get my money back. Update:the search function has greatly improved, but now the directions leave much to be desired. I have noticed that the map shows all lanes of a highway are fine, only to find that it tells me it is time to turn less than 1000 feet from the exit, sometimes it finally tells me I am turning right when the exit only lane appears. Also, on my last trip it kept telling me to get into the carpool lane so it showed me turning, every mile or two; this made it impossible to know when my real turn would be. It would be nice to get more specific info about future turns too. Finally, why is the info bar at top sometimes blue and sometimes green? I am sure there is a reason but haven’t figured it out yet. At this point I only use Sygic when I am in areas with no cell signal, otherwise I use Apple maps. I used to love Sygic and keep hoping they will finally work out all the bugs. If I can get the program to understand where I am going, it is top notch, but actually getting it to recognize an address or find a location is frustrating at best and an utter failure at worse. At one point you could share an address from Apple maps and that was great but then it was removed, by Apple or Sygic I have no idea, but pretty much an epic failure now most of the time. As I do like the maps, once I have gone someplace I mark the location so I can find it again. Laughably poor navigation, but the joke’s on me because I was foolish enough to buy the premium version. Directions are often wrong - with obvious inaccuracies that would take us well out of our way if followed, or had us leaving highways only to be told to circle back and renter them. When I ignored incorrect directions, the map acted as though I hadn’t and remained centered on roads I was not on for up to 30 seconds after which it had difficulty plotting a new course for several minutes. Maps themselves appear be be based on old data and graphics look dated. Lane assist a nuisance as it pops up seemingly randomly. Buggy spoken directions failed to name many streets, stuttered, repeated itself frequently, and hilariously used wrong units with alerts like “speed camera in 1000 miles.” Unsure where they are getting their traffic data but it is not even close to real time. Also unsure where their five star reviews are coming from. Wouldn’t be a real issue if this app weren’t so expensive. Pay to CarPlay.. pay pay pay..
There’s great features in this product. I love the stop light camera warnings, I love that it warns you if you’re going over the posted speed limit in an area. The traffic updates are far better than competing products or the built in iOS app. There are some quirks: speed limit zone aren’t accurate in my area - sometimes being off by as much as 15 MPH and there are weird artifacts like my next door neighbor’s house being listed as a restaurant(it’s not). Also - everything is an upgrade or a “premium feature”. Some things I can see why: Their real time dash cam is an upgrade - ok that’s fair. Their real view AR navigation is an upgrade - ok. I can see that too. Map updates for life? Painful but at the moment cheaper than competitors. But CARPLAY SUPPORT IS A PAID ADDON? Really? That’s just gouging people. Either offer support or don’t. Doesn’t need mobile data connection! Great everywhere. We used Sygic for two years touring the western USA in a Sprinter Van type RV. Other than downloading maps, it does not need cell data for navigation. Even in the desert where there was no cellphone reception, and therefore no Google or Apple maps, Sygic never failed us. 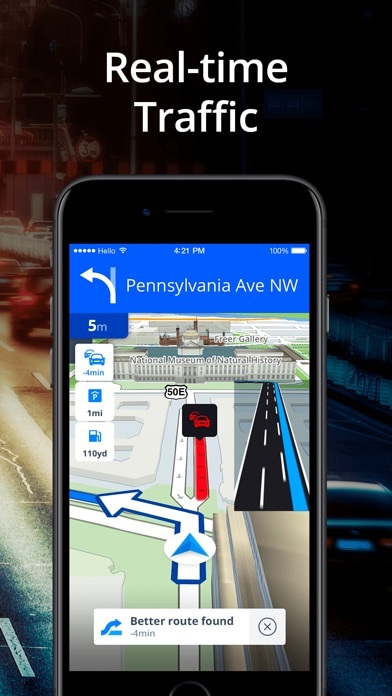 The app keeps getting better and better with updates and features like head up navigation on your windshield — which is so helpful driving at night. Much better than a Garmin or Rand McNally dedicated GPS. On the iPads you get an amazing large navigation screen, unlike a small GPS screen. The small lifetime payment gives me Sygic on my iPhone, iPad and iPad Mini. This is one of the top ten apps of any kind I’ve ever used. I have just driven from El Salvador to the US border. This program has taken me to parts of Puebla and San Luis Potosí that I would not recommend anyone traveling to. The routing algorithm is flawed, or the maps are not up to date. In Mexico, where I was advised that they had up to date information, there are hundreds of petroleum stations not in the database. I have not been able to find hotels that have been built for at least five years. Just this morning I wanted to leave San Luis Potosí for Monclova and even though I could see the correct road in front of me, just 20m away, the program tried to route me down backstreets that were not in any way main highways. I drove to the highway and the program continued to try to route me elsewhere. It’s flawed, no doubt in my mind. I ended up having to use Waze to find my way correctly. Waze knew every point I put in. It found all the hotels I wanted to stay at. Also, the color scheme for the day is absolute rubbish, it can not be changed, and it’s almost impossible to see roads around a route. Want to try to divert to a different route? Forget it. Once the program runs its impossible to try to look for an alternative to avoid accidents or roadworks etc. In short, it’s a flawed product. The crew cares about taking your money but not to fix this broken app. You put so much money into it and yet this app useless. Very pricey too. I thought this would be better than Waze but it's a complete garbage. Customer service is horrible. It's takes almost a month for customer service to contact you and when they do, they can't even help you with your issues. At least Waze is free and dependable and reliable (does not crash). Making an address or POI search in like impossible. It does not even come up and it's constantly crashing. Stay away from this over priced garbage GPS app. DO NOT LET THE NICE INTERFACE FOOL YOU!!!. It's all for the money but not about fixing this app. They also use very old maps. The arrow on the map course falls off the map and then rotates in confusion. THAT RIGHT THERE IS AN EXTREME HAZARD THAT COULD CAUSE AN ACCIDENT. Stay away from this app until they take the initiative to fix this app. This would have been a 5 star review. Let me start off by saying that this was the ONLY app I used for GPS. 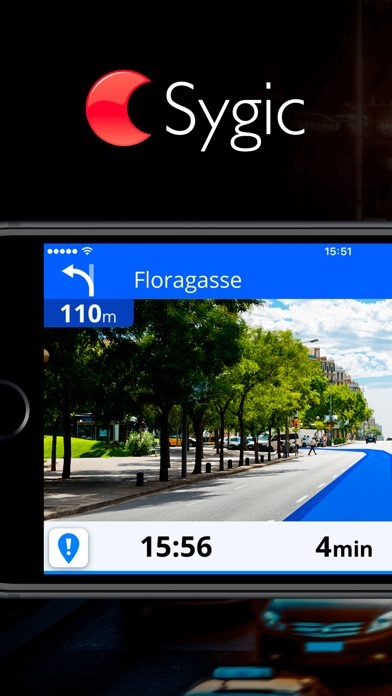 I loved it better than Google Maps, Apple Maps, WAZE, if there was a GPS app—I tried it. 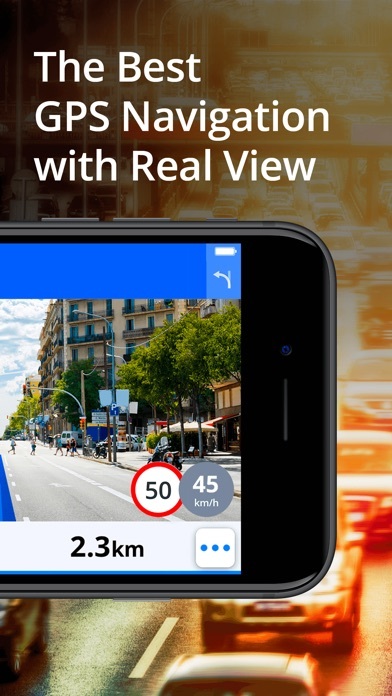 It’s an amazing app with really great features that you would get on an extremely fancy GPS unit (TOMTOM,Garmin, etc). I did pay to have accessibility to all of North America and some of the other add-ons you can purchase. I honestly didn’t mind paying the $20+ fee for all maps because of the offline map capability and the $5+ fee for the add-ons because the heads-up display is pretty cool. My frustration set in when Sygic was finally compatible with Carplay. I received a notification that it was finally available. I open the app, connect my phone and saw LIMITED CAPABILITY. I opened the app to see if I was doing something wrong when I saw the $35 fee to get full access on Carpay. You mean to tell me I am probably going to end up paying $60+ for a GPS app? It’s pretty messed up for this company to charge its already paid users a pretty hefty fee to have full access to a screen mirroring image on my dashboard. Thanks, but no thanks Sygic. You just lost me. If you make the fee $5 like your other add-ons, then sure. Although it really should just be included. This app is great for those that want a truly offline map option and the lane assist is great....in theory. What I don't like is the fact that it waits until under 2 miles to tell you which exit you're looking for, which doesn't give you enough time to get over on some interstates. And quick interchanges are very confusing. I'm talking about those interstate exits that split into multiple lanes for different roads. This app doesn't give me enough information to get into the right lane fast enough. The only way to help this is to make sure you have the sound turned up because the voice seems to give you a bit more information. However, I prefer to drive with voice off. 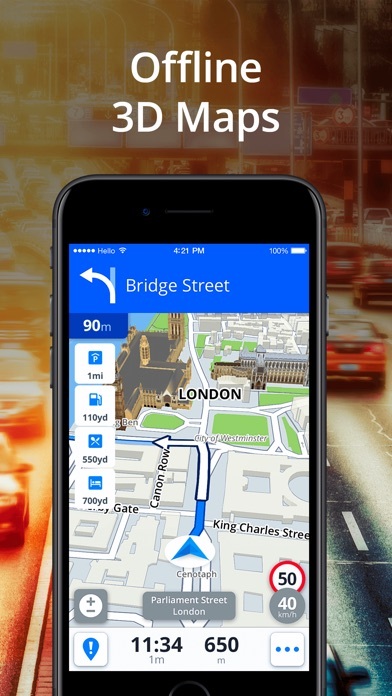 This is one of the better GPS app outside of Apple Maps. I love the number of lanes it shows while drive and which lane to stay in before exiting the highway. The required speed limit for the road has been accurate and the navigation has been accepted. My disappointment has been in how slow it responds to redirecting when a turn is missed or when it suggests a faster route. You can drive another 10 yards before it catches up with you to get you back on track. This almost a deal breaker and hope the next update addresses this critical issue. Also, it has trouble locating me when sitting in my driveway and i'm ready to goto my destination. It doesn't locate until I begins driving so I'm not sure if I have to make a left or right when I leave. Another problem I've found is that when it's time to exit it doesn't show or announce the exit until around a mile until it's time to exit. This is way too late while you are in rush hour or unfamiliar with the area. Redirection is too slow it takes about 20 yards or so to realize that you've missed your turn and need be redirected. Not good! Taking this app down one star. During the trial period, everything seemed to work flawless (which is why I purchased it). But, since I purchased it, I am finding more and more flaws...such as, it doesn’t save my settings. Almost every time I open the app, something has changed. I have “fastest route” in my settings, but when I preview the routes, the primary route it chooses is not the fastest. When I change the route and select the “fastest route”, it goes back to the “longest route” when I start driving. The speed limits are not always correct. There was a good 3 mile stretch of interstate where the indicated speed limit was 5mph faster than what it should have been. I drive this route a lot and it has been the slower speed limit for a very long time (years, not months!). Apparently, all they want is your money! I downloaded this because it markets itself as an app that works with a HUD. It’s a separate mirror component that has a mirror and gives you a HUD using a normal phone. All it needs to work is for the phone to project backwards. Think of how something is reflected in a mirror. I paid the $5.99 to unlock this “premium” feature. But it doesn’t give you navigation on the “HUD” display. It just tells you your speed and the speed it shows is wrong. Don’t waste your money. HUD does NOT work on this app. Update: They added a response that says to contact customer service. The app does not work as intended. I have never had to contact customer service for anY app in my life. Especially a navigation app. I downloaded another app with HUD capability. $2.99 and works right away. DO NOT DOWNLOAD THIS APP. IT COSTS MORE THAN THEIR COMPETITION AND DOESN'T WORK. GARBAGE. I bought the add ones because they were fun and I wanted to see how it compared to other mapping programs, and because I wanted to see how it compared to Copilot as an offline map for travel to UK. I don’t think I really used it much, but then it popped up on CarPlay. The CarPlay map display is ok, but the real problem is that the search engine is completely worthless. You cannot find where you are never mind finding where you want to go, unless you know the exact address. I am currently staying in a hotel which is displayed on the map, but typing the name of the hotel returns nothing. I tried it for lots of places on the map and got the same result. I can give Siri incredibly vague requests and always seem to get a good answer. I just bought this and the maps are very cool as well as the interface, but the system does not work properly. I have used this once, and tried using after but for some unknown reason, it shuts the app off on my iPhone 6S. I don’t know if the problem is my iPhone itself, but I really don’t think so. It also causes my phone to overheat, and probably that’s why the app crashes. I was in the middle of the road when it shut down for first time which is very frustrating especially when you’re paying for something, you expect more reliability. (in my case) I don’t know what the solution is, but if there isn’t an update that fixes this, id kindly ask for a refund because so far I’m not seeing my money’s worth. Good but dashcam needs work. This is probably the best set of offline map tools I’ve seen for mobile. I know the dash cam is a secondary gimmick component to the maps app but to really be able to market it as a dashcam replacement please add a mini-map or split screen map/video recording option. The saved video file needs to include more than just the gps location, it needs to show your car moving on the map as you drive along with the camera video. As a dev myself I know this would be fairly easy to do just by copying your map canvas and overlaying it on the video frames before writing. Paying for Premium Features is ridiculous when you can get them for free with another app. After doing a little research, I found this app to be the most downloaded GPS navigation app in the world with free features, so I downloaded the app to give it a try. When it comes to navigation apps I’m very particular. After testing (Sygic) GPS Navigation I found a couple things I didn’t like, this app is hard to navigate while driving, not user friendly at all. 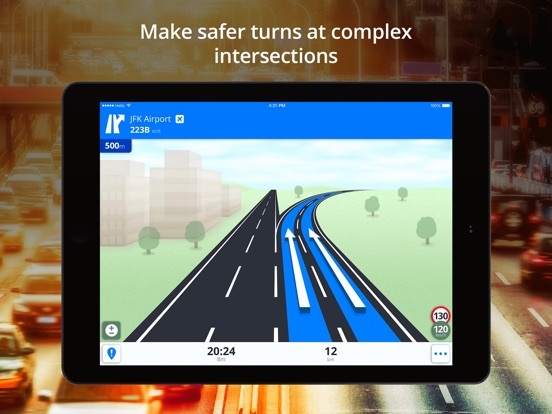 Plus the features that are free are very basic, features such as navigation, speed limit warnings, real-time traffic info, dynamic lane assistance, and junction view, you have to purchase the premium package is order to use them. I found another app I will be using that will include all these features, FOR FREE! Route planning is very frustrating! I really wanted to like this app for a lot of reasons - it has features that really sounded useful, and the downloadable maps would be good for when I sometimes spend an hour or so driving through areas with no cell coverage. But I put in start and endpoints for a 2000 mile trip I do several times per year, and it gives me several alternative routes. So far, so good. The. I try to zoom in to see where the routes go. Bad news! Even for areas where I’ve downloaded the maps, you can zoom in to see which highways will be used, or even what cities the route goes through! You can go and look at turn-by-turn directions, but that’s mind-numbing for a 2000 mile trip, and it can still be difficult to get context. Turning right on Main Street, for instance doesn’t toll you what TOWN that turn happens in! I may try it out for some simple short trips, but at the moment it seems like it’s been a waste of both time and money... If I can’t work it a route beforehand, it’s obviously not going to be helpful if I have to make changes while I’m in-route... I’m very disappointed! It always crashed just after I opened it. Sometimes crashed after I chose a destination and tried to get directions. It was good while it was working, it gives forecasts, visual, vocal directions. When it crashes several times when you trying to get directions, it frustrates. It didn’t happen before IOS upgraded to 11.0.1. It also doesn’t have small roads map, like the pathway from main road to my house, or main roads to a point in a community which is actually quite misleading. I paid for the package deal. I feel really disappointed now. I started using this app on my in-dash Android-based car unit. It was much better than the mapping app that originally cane with it - plus this one has a legal license. There are some difficulties with it though. I live in the Washington DC area and it has issues with finding some locations and is not good with commute lane directions. 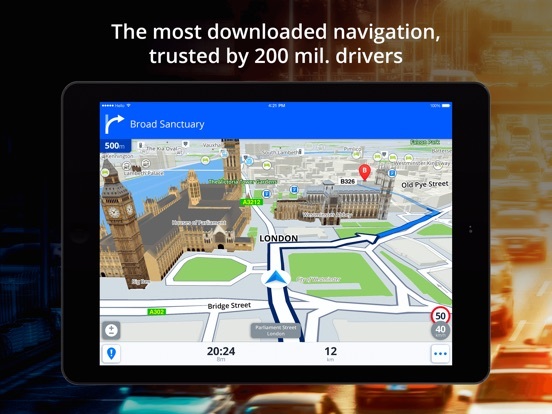 In addition to this app, I use Google Maps, Waze and the internal Land Rover navigation apps. I recommend it over most other these other mapping apps. I just spent good money on this app so I would have an off line choice for apps. Now the app keeps sending me push notifications to buy useless for features I am not interested in. The app isn’t bad but it’s features are hard to use with notifications turned off. This is the only way to stop the annoying push notification from them bugging you to buy some unnecessary feature. I already bought the world navigation traffic pack and spent good money on it. Why would you pester me like I’m using the software for free. The only way I will give this application more stars is if they I can turn on my notifications and not be marketed to. I only want notifications about navigation. Bought the complete worldwide package but there arent any maps for central america and if they appear, its i lu the name with ni download available. I provided email feedback to developers but no response one week later. Great app if only it had more than 5% of streets showing. Never been able to use it. Im on vacation in El Salvador and the map download is only 4,5mb in size so as you can imagine it shows almost no response when searching for a destination. This is the response i het 1 week later! “The issue you have described is caused by the quality of the map data we have received from our map provider. As soon as we would receive new data for this map, we will implement them in the next update. Thank you. Jaro from Customer Support" So what the developers are saying is this: we agree the maps arent working, we agree we took your money for the app but its not our fault, good day and bye. The fact is the product purchased clearly states worlwide maps and by accepting the purchase they agreed to provide the service. Apple itunes is not even responding to me on this either. 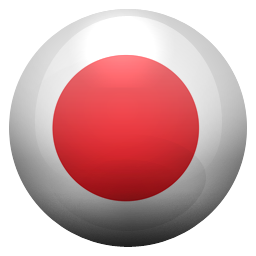 I’ve used this app in Italy and the USA and overall it has been quite helpful. However, I have seen a persistent bug where the app stops providing audio cues. It stops talking for no reason at all, right in the middle of trips. This is very bad because it’s dangerous to have to look at the phone carefully while driving. Without the audio the app is not nearly as useful. I have a standard iPhone 7 and I can’t seem to fix this problem. I hope the company will respond and address it, or suggest something I should be doing. I recently purchased this app and upgraded to premium + traffic & real view navigation. I also downloaded 5 states maps where I travel frequently. I was very disappointed when I put in 2 addresses of prominent hotels, it could not locate them. I feel technology is at a place today where maps can be updated frequently from many other social platforms. I also felt the iWATCH app was not very robust in functionality. The heads up navigation works very good as I'm rental vehicles frequently for work. I also have a hard time adjusting the voice volume for driver feedback. Does seem to get confused over medians in some areas. Will tell me to turn right and then make a u-turn as soon as possible when I should just turn left. This is always in a place where there is a median but there is a break so you could turn left with no problem. Aside from that it took me on my family vacation from IL to NYC them up to Niagra Falls and over to Sandusky,Ohio and back home again without a hitch. I drove directly downtown in NYC and stayed at a hotel 3 blocks from Times Square and didn’t give me a single wrong turn! This is a really good navigation app. Only problem I've found is you can not use dash recorder while using navigation. Really??? 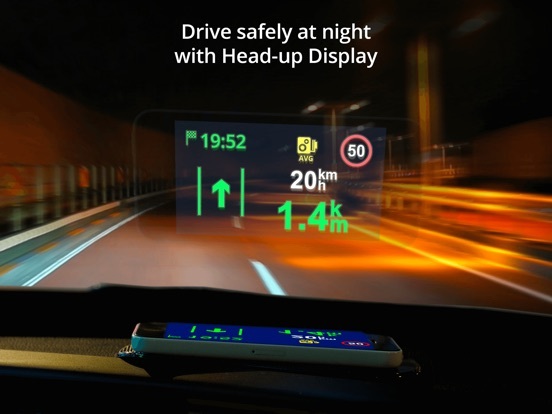 If I would have know this I would have bought the heads up display instead of dash can. I really like the idea of using a dash cam. But what good is it if you use navigation. Sure record your drive in case of a accident but you can't record as see where you are going. If you could I would give it 10 Stars. Refund my dash can money and I'll buy heads-up display. The app is a pleasure to use. It is easy to find destinations, and the directions are flexible enough to take into account traffic changes. One problem with the app is that there is no setting to prevent directions from sending you across through a non-signaled, busy intersection. An alternative used by UPS is the ‘no left turn’ restriction, which is generally faster. Either or both of these options would be an improvement. Don’t let me talk you out of getting this app — it is excellent without my suggestions. don’t buy this app. use google map for free and get a real gps device for offline maps. bought map cause I wanted offline access as i am anticipating on being in areas with poor cell service but very disappointed after purchase. 1. not user friendly or intuitive. 2. nav voice is terrible computer voice. 3. a major hotel in major downtown city doesn’t even show up. 4. tested offline map in my neighborhood and the information is not updated or inaccurate per businesses in the area. the grocery store around the corner from where i live is not even on the map. it’s been around for at least 25 years. *** UPDATE - Their Tech/Customer support tells me they update maps when information is provided. Really? It won't find most addresses I searched including well established locations. As my original review notes I live in a major metro (9th in nation, 6mm people). Won't find local restaurants, etc. similar to Google Maps or Waze. Thus far a waste of money. I've requested a refund but they tell me that's Apple's problem. Strange because isn't Sygic the recipient of the money I paid? In any event, until this app is on par to Waze/Google Maps do NOT waste your money. Stick with the WORKING free apps. While the app is great in my opinion, it lacks updates on the map for newer locations. I needed to go to a relatives house but their address as was not registered in the downloaded map considering that the house they moved in was recently constructed about a year ago or so. I ended up using google maps because it’s more up to date and promptly with the changes. Like I said, I really like this app and would like to use it as my go-to app for navigation so please update it considering I paid for the in-app features. I’d rather this investment would not go to waste. Everything you see on your screen is backwards. I have been using the app for a few days and I am really enjoying it overall. The main thing that I would like improved is the HUD feature. I am having a hard time only following the arrow. I would like to see the road like in normal view. Also, it would be really helpful to have the name of the road or freeway that I would be turning at next so that I can look out for that as well as following the arrow. I am looking forward to the future improvements! some intersections can be turned but it actually takes me to go further down and then make a u turn and turn to the road. or some turns are can’t-dos but guided me to it. For example, on Queens Blvd, New York, you can’t make turns into middle lanes from outside lanes, but it always takes me from outside lane to make a left turn and then turn right. Ridiculous and dangerous! By the way, if you have ios 12 you are in trouble. the voice will become a garbled man which always saying SPEED EQUALS 25 before almost all sentences, which I found out was IOS 12 not compatible with this app yet. Not only this, but also going for exits, it will say something more weird. Now that unlimited data is getting more popular, again as before, Sygic is almost like garbage comparing with google maps. Two stars for the effort creating the app, and being somewhat an map for some times helped me got to places.